1. A wealth of know-how and experience on security and device management obtained from a total of 2.7 million systems. 2. World’s fourth largest IT services provider and No. 1 in Japan. 3. One-stop shop solutions spanning infrastructure, application to services. 4. Fujitsu service management process meet a variety of certification standards, including ISO 27001 and ISO 9001. The majority of security incidents are caused by human factors. 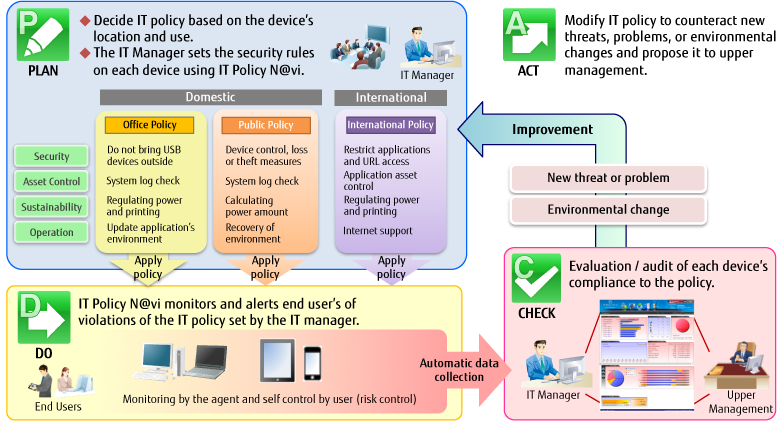 Fujitsu’s IT Policy N@vi, the all-in-one cloud based end point security solution is provided to enforce IT security policy and governance on user devices including PC, Laptop, Tablet, Smart Devices, etc. Preventing end users from exposing information or causing security incidents. Increasing employees’ IT literacy and knowledge.